The conference will be held on May 4 from 9:00 a. m.-5:00 p. m. at 15201 Neabsco Mills Road, Woodbridge. 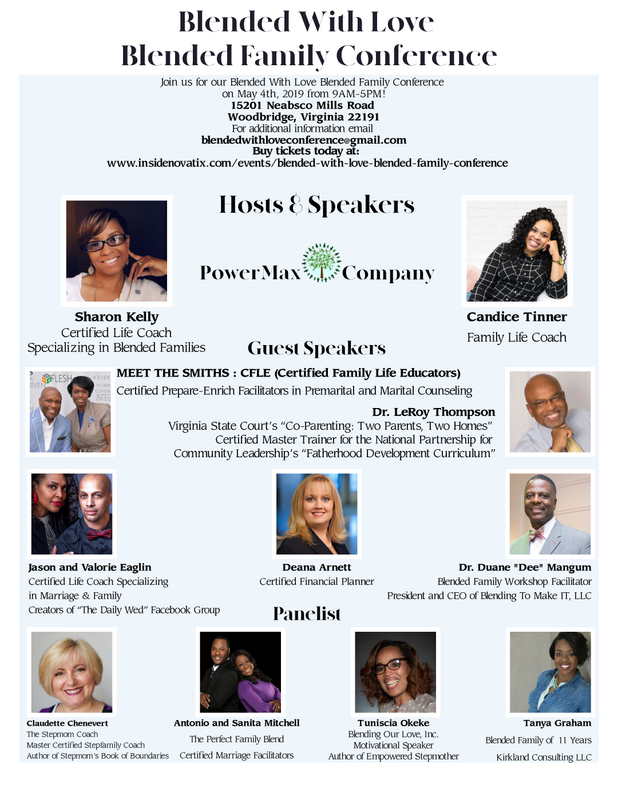 We will have several speakers that will discuss effective communication, budgeting/finances within a blended family, co-parenting, custody, managing schedules, treating children equally, couple time, and time to self. There will be a paint and sip with non-alcoholic beverages, panel discussions, raffles, games, prizes and vendors. Couples tickets are $45.00 and single tickets are $35.00; until March 31. Starting April 1, tickets for couples will be $75 and $45.00 for singles. Tickets may be picked up at Will Call on May 4. Tickets will not be sold at the door. For group rates (20 or more) email [email protected]. Daycare will be offered by Nikki’s Christian Daycare Center, 14900 Cloverdale Road, Woodbridge. To Schedule Contact 703-897-6232. For more information please send an email to [email protected]. Guest Speaker: Rev. Dr. LeRoy Thompson Jr. has a heart for outreach and taking the message of the gospel outside the church walls. This has led to him performing jail and prison ministry, coaching collegiate sports, serving as a Fairfax County Community Chaplin, and teaching parenting and fatherhood classes. He is an instructor for the Virginia State Court’s “Co-Parenting:Two Parents, Two Homes”. He is a certified Master Trainer for the National Partnership for Community Leadership’s “Fatherhood Development Curriculum”. LeRoy also conducts the Fairfax County Public Schools Family And School Partnership’s “Dads Matter Class” and is a parenting program instructor for the County’s Department of Family Services. He is certified in Critical Incidence Stress Management and Pastoral Counseling Intervention. Edward and Debbie Smith give new meaning to the term “Power Couple”. With a foundation built on their belief in God, they enthusiastically embrace their mission to help others reach their full potential in life. Guest Speaker: Deana Arnett joined Rosenthal Wealth Management Group in 2004, as a Financial Planning Consultant. The firm’s philosophy that everyone deserves proper financial planning, no matter their amount of assets, made Rosenthal Wealth Management Group the perfect fit for Deana. She focuses her work on retirees and federal employees, as well as female investors. Her passion lies in helping women professionals, divorcees or widows navigate the financial planning process. Deana’s insight on investment and financial planning strategies is sought out by media outlets across the nation. Her commentary has appeared in a number of leading print and online publications, including Forbes,Better Homes & Gardens, LearnVest.com, SmartMoney.com, FoxBusiness.com and Bankrate.com. Guest Speaker: Jason and Valerie Eaglin met in Maryland in 1989. After dating for three years, they were married in 1993. They have four children and 10 grandchildren. They believe that the foundation of every family is influenced by the strength of the marriage between the heads of household. Jason and Valerie are committed to each other with a passion to see other marriages grow in love and thrive. Guest Speaker: Dr. Duane Mangum is a 25 year retired Air Force veteran, as well as a retired Federal Government Civilian Employee. I’ve also have been blessed to earn his Associates Degree in Applied Science with a concentration in Education and Training Management from the Community College of the Air Force as well as a Bachelor’s and Master’s degree in Business Administration from Concordia University and completed a Doctor of Philosophy degree in Christian Counseling from Trinity College of the Bible and Trinity Theological Seminary. As of January 2016, Dr. Mangum became a certified SYMBIS (Save your Marriage Before It Starts) facilitator, as well as an “Active” Presidential Member of the American Association of Christian Counselors and a Silver Member of the Black Speakers Network.